Are you there? It's been a very, very long time. Did you miss me? If I had to guess, I would say you didn't. Why? Well the biggest reason would be that you killed me. Yep. Do you remember? You do? That's good to hear. The 2007 collection of Valve hits the made up the Orange Box was an amazing deal for gamers. Whether you were new to Half-Life or not, there was plenty of gaming to be had. With Half-Life 2 and it's two episodes, and the multiplayer phenom Team Fortress 2, you had plenty of things to shoot and kill. Then there was Portal. This puzzle game was full of innovative gameplay, memorable characters and a new antagonist that remains a fan favorite. 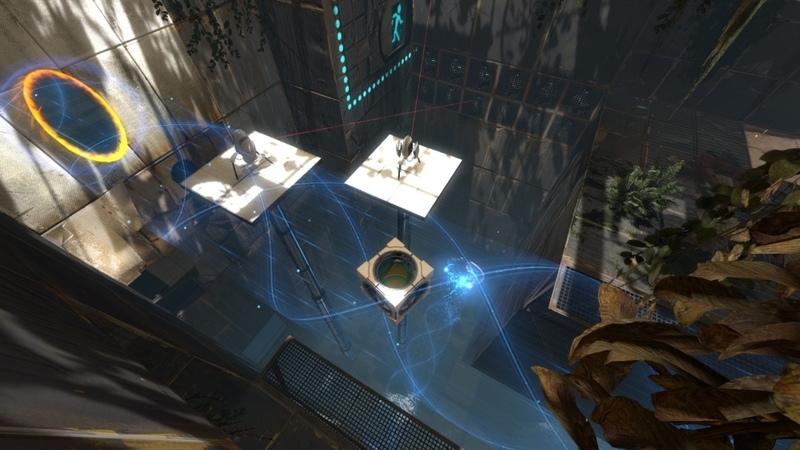 Originally beginning as a student project, Portal became a nice addition to the Orange Box, and soon after fans and critics fell in love with the game. 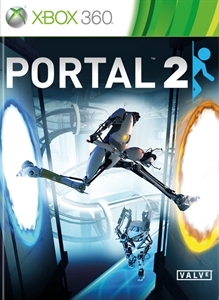 A while after the Orange Box, Portal was re-released on Xbox Live Arcade as Portal: Still Alive and featured more puzzles from the Steam version of the game. Forward to four years later, Valve has released a full $60 retail game featuring Chell once again using the portal gun to find a way out of Aperture Science. Can she finally escape GLaDOS and the many surprises in her way? Everything the makes Portal 2 so great is that is provides many twists and turns that must be experienced first hand. It would be shameful to ruin any of that, so I'll talk about what's known and stay in the safe zone. 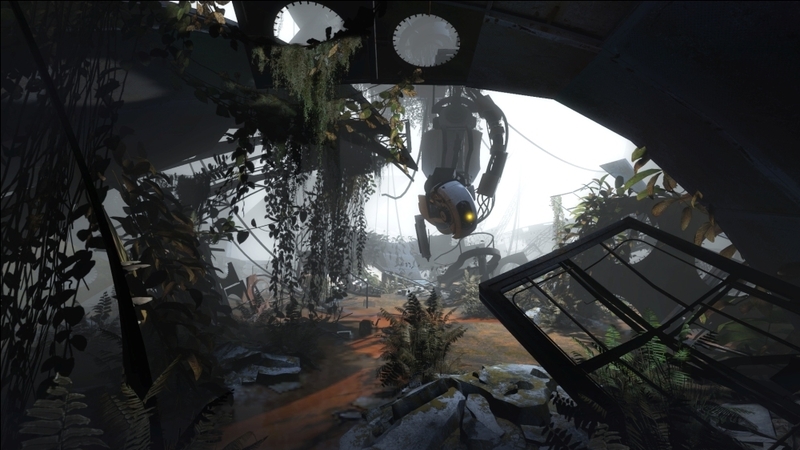 Visually Portal 2 looks great, and seems to be taking advantage of the passing of time between the original game as it shows new areas of Aperture to a nice degree. It looks and feels a lot more open now, and instead of the clean, white organized rooms, you can see the effects of nature taking back it's land since there seems to be a lack of staff around to clean up the place. GLaDOS may not like the way it looks, but I'm sure you will appreciate the change in the setting as I did. Is your thinking cap on? The great thing about playing Portal 2 is that when you observe and scan an puzzle, get frustrated for a bit and then come back, there's nothing quite like it. I guess you compare it to getting the winning kill on Call of Duty, or successfully returning the flag from a team of rocketing wielding Spartan on Halo, but the feeling at least to me is a bit more than that. The difficulty of the puzzles can vary among people as well. You could spend hours contemplating one section while a friend may breeze through the exact same part. Which is why you would probably want that friend to join you for some co-op fun. Stated to be roughly twice as long as the campaign from the original Portal, co-op in Portal 2 is a ton of fun. 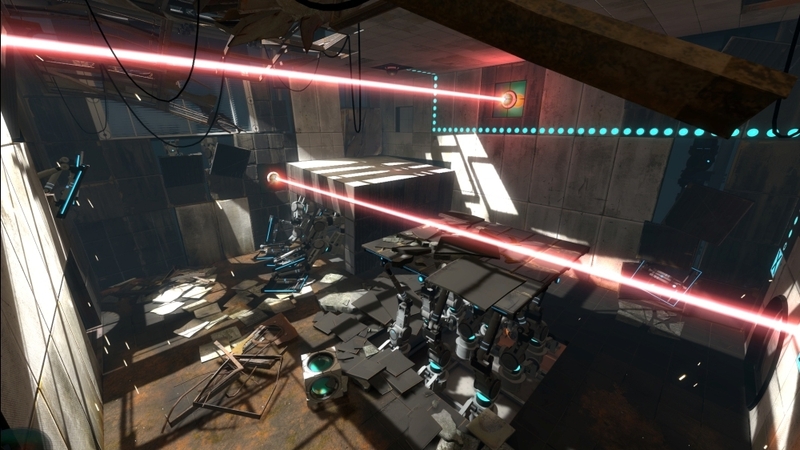 Players will control two co-op bots named Atlas and P-body, who were specially made to test for GLaDOS. The host of the session will control Atlas, the shorter of the two, and second player will control P-body, the taller robot made with the body of a turret. In co-op, you can make funny gestures, as well as spot locations you want your partner to portal in case you play without a microphone. This makes playing with a matched player a bit easier when you're friends are not available to play. All of the gameplay elements you will come across in Single player will make their way to co-op, so completing the campaign on your own will help a bit when you're to tackle co-op. While Online play is the main way to go, you can also play with a friend via split-screen if you wish to work together with a person in the same room. Portal 2 is surprisingly lengthy with a nice variety of gameplay to engage in. Voice acting is superb, and the minimal cast make a maximum impact with the story. Co-op is great whether you play online or off, and the achievements are fun & challenging to go after. If you're on 360, you can enjoy some pretty cool avatar awards to unlock, and on PS3 you can enjoy the cool features from Steam such as cross-platform play with PC users. PC users of course will have access to modding abilities down the line so you can expect plenty of cool user-created content coming your way. If you played the original Portal and enjoyed it, you gotta get Portal 2. If you've never experienced Portal yet, then you gotta play the original, enjoy it, and then get Portal 2. Right, GLaDOS?